The tiny house sauna wasn’t where we met. When I met John Pederson through a mutual friend, it happened entirely by accident. I was at a coffee shop with my friend David, and John happened to pop in holding a tube of giant rolled-up papers. We invited him to join us, and he did, unraveling the papers to reveal blueprints for something I had never imagined existing—a fully mobile, wood-fired sauna built on a trailer. The plans were based on what he had learned while building his first project, a tiny house with a full-sized, wood-fired sauna and bed loft. It was a project that took him—along with the help of Glenn Auerbach and many others—about a year and a half to complete. The next time I saw John, David and I were wearing bathing suits and I had a towel over my shoulder. John had fired up the sauna stove in preparation for our arrival. We were there to experience the tiny house sauna (the one highlighted in the above video) for ourselves. 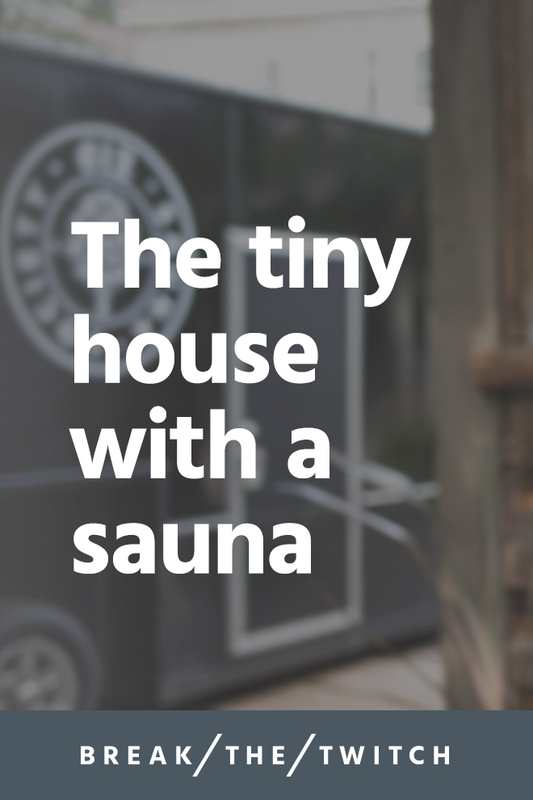 The tiny house sauna experience was surreal. We drank some tea, then sat down on the highest bench of the steamy, 195F-degree room. While I’ve been in saunas before (mostly at various gyms and health clubs I had been a member of in years past), this experience was different. Perhaps part of it was sharing the experience with two people I knew, but this was also the first time I’d been in a sauna since starting Break the Twitch. I noted that we were sitting in a dimly lit wooden box, in an intense yet oddly comforting heat, without any of our phones. Even if we had been inclined to bring them into the actual sauna, the iPhone’s heat sensor would have automatically turned them off. I’m grateful that I didn’t think to test that function, though. The entire experience felt incredibly… organic. The kind of beautiful, shared experience that isn’t as common as it perhaps once was. There we were, probably feeling the same rush of heat and steam each time the lelu poured more water onto the hot rocks. After a twenty-minute session, I stepped out of the sauna and I couldn’t help but notice the overwhelming sense of well-being I felt. For the duration of the session, it felt like the whole world beyond those walls went away. The heat pulled me inwards, solidly into the present moment—not worrying about what I’d be having for dinner or what notifications I might have waiting for me on my phone. We were all just, there, right then. You can probably understand why I wanted to share this video with you, to highlight John’s perspective and the movement he helped foster with the creation of his tiny house sauna. I marveled at the rarity of being totally disconnected—isolated from any consumption beyond the water bottle in our hands and the steam-enriched air entering our lungs. While it was a unique isolation, I didn’t experience it as an “escape.” The whole world was still there, still spinning, but what mattered in that moment was just the small space we were in, the collective experience shared. Meeting John and experiencing the tiny house sauna sparked a couple major takeaways about life and doing more of what matters. When John started building his tiny house sauna, he didn’t intend to start a movement throughout Minnesota. He started by purchasing an old tire hauling trailer and got to work while getting help from others. He wasn’t quite sure how that trailer was going to become a functional sauna, but he moved forward anyway. Much of the time, I think we set our expectations for the path and the results far too high. This expectation can become an immense pressure, which can turn into perfectionism, which often leads to a failure to start. When he started inviting people over to sauna every night, he had no idea the tiny house sauna would eventually become the United States’ first community-owned and operated mobile sauna cooperative. He had no idea he would be starting a movement and rekindling a sauna tradition in Minneapolis, Minnesota. For most of human history, we’ve been in varying, and often un-ideal temperatures. Only with the advent of air conditioning and heating systems in residential houses starting in the 1950’s have we been able to capture ideal comfort levels on a fairly regular basis. Experiencing the immense heat is a reminder of just how resilient we are and what we’re capable of withstanding for periods of time. It reminded me of the discomfort we feel when we work to break the “twitch” in our lives. The discomfort we feel— that the twitch solves for us momentarily—is something we can likely handle. And just like the sauna heat, after a few minutes, there is a strange comfort—in breathing, being and relaxing in the discomfort instead of escaping it right away. Learning to embrace these types of discomfort in our lives is what allows us to make choices more intentionally. When we can find comfort in the uncomfortable, we really can choose better and make big changes over time. I certainly didn’t expect a tiny house sauna to inspire such meaningful takeaways, but I’m not surprised. There’s a reason why sauna has been such a longstanding tradition and practice in Finland and many other cultures in the world. I share John’s sentiment in hoping that more of us create the time and space for these types of intentional practices in our daily lives. Ooh, I just found your website and feel like home with this article about saunas – What a fresh way of seeing it, I love it! I live in Finland and here we are traditionally going to sauna at least once a week since we are babies, so it becomes a habit. I love sauna and it’s awesome to hear about this movement – Way to go! Welcome, Elina, and thanks for reading! Finland sounds like an amazing place – would love to visit at some point! Hey Buddy!, I found this information for you: "The Tiny House Sauna That Started A Movement". Here is the website link: https://www.breakthetwitch.com/tiny-house-sauna/. Thank you.